Santino Mercado-Vera (left) and Aimee Ford. 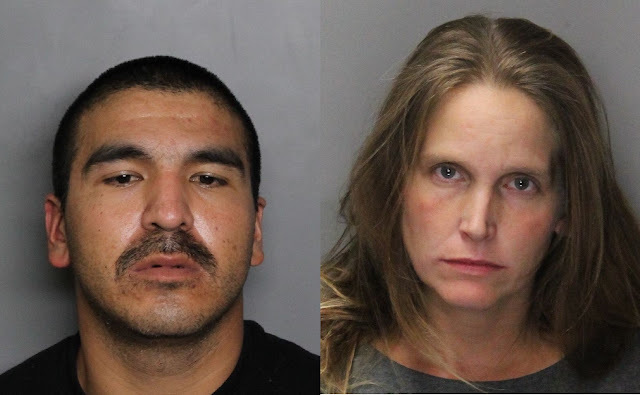 Aided by an astute victim, Elk Grove Police police arrested three suspects, one of whom is on probation and two with arrest warrants, who allegedly stole a credit card. On the mid-afternoon of Thursday, January 18, a crime victim observed a vehicle leaving her driveway on the 5100 block of Ocean Lane and saw that her purse had been taken from the front seat of her car. Shortly thereafter, the victim received notification from her bank that one of her credit cards had been fraudulently used at a nearby business. The victim was able to locate the vehicle she had seen driving away from her residence in a shopping center parking lot and called the police. Responding officers arrived and made contact with the suspect vehicle which was occupied by Santino Miguel Mercado-Vera, 29, of Sacramento. A record check revealed Mercado-Vera was on probation and had an active warrant out for his arrest. A probation search of allegedly led to the discovery of a controlled substance and narcotic paraphernalia. While officers detained Mercado-Vera, Aimee Maire Ford, 35 and Nicole Silver, 33, both of Sacramento, returned to the suspects vehicle from a business in the shopping center. Records check revealed both Ford and Silver had active warrants out for their arrests. Further investigation also found Ford and Silver were in possession of victim's debit card and had used it for purchases. All three suspects were arrested and then transported to the main jail. Silver has been released from custody while Ford and Mercado, who has a bail of $568,000 remain in at the Sacramento County Jail. Both suspects will be arraigned on Monday, January 22. No Comment to " Cops Catch Credit Card Crroks "